^ a b c d Wozencraft, W.C. (2005). "Order Carnivora". In Wilson, D.E. ; Reeder, D.M (eds.). Mammal Species of the World: A Taxonomic and Geographic Reference (3rd ed.). Johns Hopkins University Press. pp. 532–628. ISBN 978-0-8018-8221-0. OCLC 62265494. ^ "Lesser panda standing on two legs charms Japanese zoo". China Daily. 20 May 2005. Archived from the original on 2 August 2018. Retrieved 2 August 2018. ^ Bradford, Alina; December 23, Live Science Contributor |; ET, 2016 01:30am. 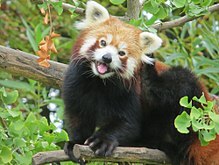 "Facts About Red Pandas". Live Science. Retrieved 24 December 2018. ^ a b Srivastav, A.; Nigam. P.; Chakraborty, D.; Nayak, A.K. (2009). National Studbook of Red Panda (Ailurus fulgens) (PDF) (Report). Wildlife Institute of India. Archived (PDF) from the original on 3 August 2018. Retrieved 3 August 2018. ^ Speigel, Lee (9 August 2010). 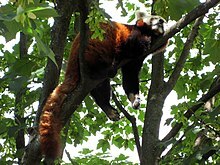 "Exclusive: Traces of Red Panda Found in Tennessee". AOL News. Archived from the original on 3 January 2011. Retrieved 23 November 2011. ^ Barber, Rex (25 May 2012). "Second red panda skeleton uncovered at Gray Fossil Site". Johnson City Press. Archived from the original on 5 August 2018. Retrieved 5 August 2018. ^ "Panda (mammal, Ailurus species)". Encyclopædia Britannica. Archived from the original on 15 May 2013. Retrieved 23 January 2017. IUCN; SSC Mustelid, Viverrid & Procyonid Specialist Group (1994). A. R. Glatston (ed.). The Red Panda, Olingos, Coatis, Raccoons, and Their Relatives (PDF). Gland, Switzerland: IUCN. ISBN 2-8317-0046-9. Retrieved 9 January 2010. This page was last edited on 25 February 2019, at 13:24 (UTC).